Welcome back to my Getting Started with Coupons series! So far in this series, we’ve already covered where to get coupons, what coupon abbreviations mean, and how to organize your coupons. It’s finally time to learn how to best use your coupons. Before I really did any research on using coupons, this is what my coupon clipping usually consisted of…I would look through the coupon inserts in my paper, cut out any coupons that I thought I might want to use, stack them up on the kitchen counter with every intention of taking them with me to the grocery store…then promptly forgetting them until several weeks later when I had to throw them all away because they were expired. Or if I did manage somehow to remember to bring them to the store with me, I might decide that saving $.50 off a $5 bag of chips didn’t seem like a good deal to me, so I wouldn’t use the coupon and it would eventually be thrown away. I didn’t feel like coupons were worth my time…they certainly didn’t save me much money at the store. When I discovered the correct method of couponing, I saw a dramatic savings in my grocery bill…from approximately $160 per week down to $50-60 per week. I was shocked…and hooked! Shop sales: To maximize your savings, use your coupon when the item goes on sale. Usually, grocery stores will cycle their sales, meaning that the items that you normally buy will go on sale every few weeks (this varies by product and store, of course). Try to buy enough of the item with coupons to get through to the next sale. If that means buying 5 containers of mayonnaise in one shopping trip, do it! You’ll be happy that you paid only $.50 for each jar of mayo instead of $.50 for 1 or 2 jars, and $3.99 for the other 3 jars. Get to know your store’s coupon policy: The shows that you see on TV where shoppers fill their carts with all sorts of items and only pay $3 for $650 worth of food is not realistic. Most, if not all, stores have coupon policies which limit the number of coupons that a shopper can use. For example, my local grocery only allows 3 like manufacturer coupons per order and only 20 coupons total per day. Although I’m not able to bring a truckload of food home for $5, I still get fabulous deals at my local store. Request rain checks: If your store is out of a certain product for which you have a coupon, ask them for a rain check! This will allow you to purchase the product for the sale price when the store restocks the product. This means that you can still use your coupons (provided that they haven’t expired) to get a good deal even after the sale is over. Stack coupons: When using coupons, you are usually only allowed to use one coupon per item. However, at stores which issue their own coupons (aka store coupons), shoppers are allowed to use them in combination with a manufacturer’s coupon to increase savings. For example, if Target has a coupon on their website for $1 off a bottle of Coppertone Sunscreen, I can use that coupon, along with a $1 off coupon from my newspaper, to get $2 off that one bottle of sunscreen if I buy it at Target. When combined with a sale on Coppertone, my savings can really add up by stacking coupons! Plan your menu around what’s on sale, not what you feel like eating: In the days when I was spending $160 per week on groceries (and eating out 2 nights out of 7), my menu planning went something like this…look through cookbooks and see what I felt like eating, make list, pay full price for the meat and other ingredients to make the recipes. Sometimes I got lucky and chose items that were on sale that week, but more often I paid full price for everything. A better plan is to look at your store’s weekly ad, see what’s on sale, and plan your menu around that. If ground chuck is on sale that week, plan to have meatloaf or hamburgers on the grill, not pork tenderloin. When you first begin using coupons, you may feel overwhelmed and frustrated. Take my advice, pick one store and start slowly rather than trying to shop them all at once. Sure, you may miss a couple great deals, but it will save your sanity! Get to know your store’s sales cycle and coupon policy (every store is different!!) and practice using your coupons until you have it down pat, then try the drugstore or Target. 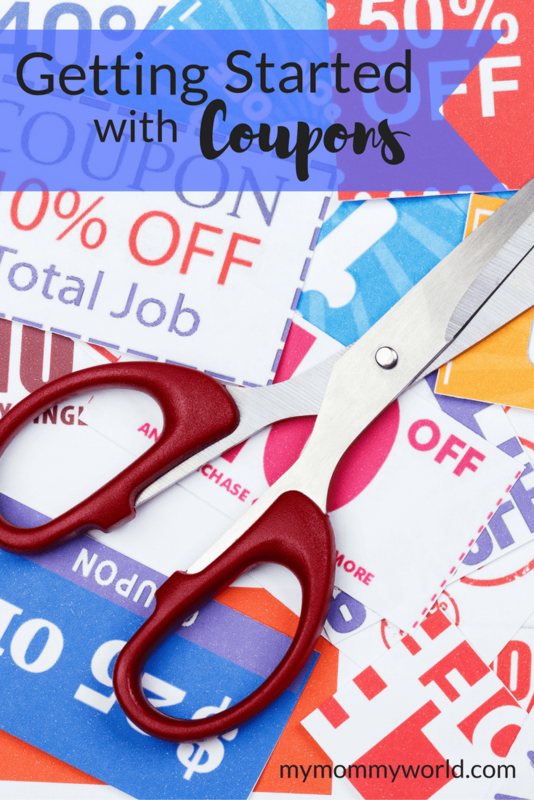 Taking the time to learn to coupon is well worth it in the end, so stick with it and have fun saving! If you have any questions on the steps I’ve outlined here, or if you just want to know more in general, leave me a comment or send me an email…I’d love to help out! In the meantime, check out my post on My Top 10 Ways to Save Money at the Grocery Store. I recently got a raincheck for Tyson chicken strips. They were on sale buy one get one free and I had a Catalina for $1.50 off but by the time I had made into the store they were out of the ones my family likes. I just purchased them with the raincheck this week and they were on sale too so the cashier gave me the 1.50 off the sale price as well as my raincheck. So I need up paying $3.25 each for chicken that usually sales for $9.99 a bag. The raincheck in this case actually ended up saving me more.